We just got in some tube beads at awesome prices. 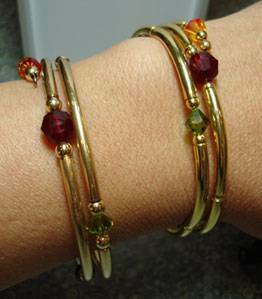 The photo shows one bracelet made with gold filled tubes and one made with our new gold plated tubes – can you tell the difference? The supplies for the gold filled total over $50, and if you use our new plated tubes the total is less than $15! This elegant project is easy to make, and because you’re using memory wire, you don’t have to worry about the fit! Gather: Swarovski Crystals in colors representing the birthstones of each grandchild, memory wire (check out the new gold and silver plated varieties! 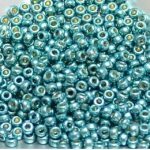 ), silver, gold or copper plated bead tubes,3 or 4mm metal or glass beads for spacers, memory wire cutters, round nose pliers. Design: Decide which order the stones should go in – will you use birth order, or mix them up according to how the colors look together? Bead: Cut off a length of memory wire several loops long (more if it’s a big family!) Make a small loop at the end of the memory wire. String a couple of the spacer beads, a tube, a spacer bead and a crystal. Repeat with a spacer bead, tube, spacer bead and another crystal until complete. Trim the wire, leaving about ¼” and make a loop with the ¼” wire at the end. Important tip: always use memory wire cutters when cutting memory wire so you don’t damage your other cutting tools.